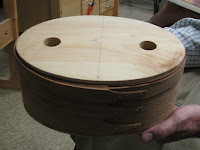 At the [boys] woodworking club meeting last night, the topic was "How to make Sh aker Oval Boxes", a presentation given by fellow club member and President of Volunteers of America, Alan Garner. The Shakers used oval boxes to hold everything from nails to thread to dried food to paint pigment. According to Alan, Shaker oval boxes were the original tupperware. Typically the boxes were made with pine tops & bottoms and maple sides. Originally they were painted bright colors, but when natural wood became the fashion in the mid-late 19th c., the Shakers switched to clear finishes. 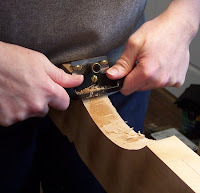 Using a belt sander, Alan feathers the squared-end of the wood strip that will lie beneath the fingers of the box, creating a smooth overlay. The fingers are already cut to shape when he soaks the wood strips (that will become the walls of the box and lid band) in a water-filled metal box which sits atop and is heated by an electric hot plate. 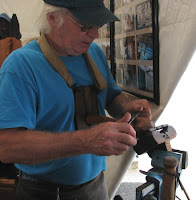 Once the wood is wet, he uses a utility knife to cut a 10º bevel on the fingers. Then he reheats the wood strip. 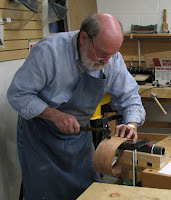 Working very quickly, he bends the heated wood around an oval form and marks the point of overlay with a pencil. He removes the wood from the form, re-bends it and aligns the pencil marks. Using a 12" long, 2" thick pipe as an anvil, he fastens the box together with copper tacks, which are hammered through pre-drilled holes. Copper tacks will not stain wood as steel tacks will. 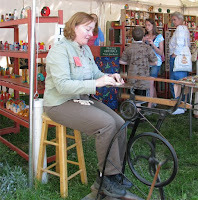 By tapping the tacks into the wood while it's resting on the pipe, a hook is created on the point of the tack and it bends itself back into the wood. Two shapers are inserted into the top and bottom openings of the box to help maintain the shape as it dries. The heated lid band is bent around the box to determine the circumference, marked with a pencil, and tacked together in the same manner as before. The box is allowed to dry for 24 hours. Alan uses either quartersawn wood or plywood for the lid and bottom of the box and marks the shape by tracing inside the box and lid band. 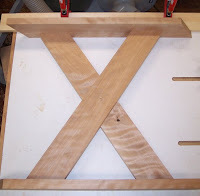 He then roughs out the shape on a bandsaw and uses a disk sander to create a 2º bevel along the edge. 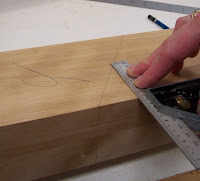 To fasten the plywood inside the lid band and bottom of the box, Alan uses a jig to drill holes for square-sided, wooden toothpicks that act as dowels to pin the pieces together. In the second to last photo you can see 2 toothpicks along the bottom edge of the box. The jig secures his drill, and a wood rest, placed in front of the drill bit, positions the box at the right height for drilling. For a finish, Alan uses General Finishes Arm-R-Seal Oil & Urethane Stain followed by 2 coats of paste wax. And the result, along with Alan's fine craftsmanship, is gorgeous. Everything you need to start making these boxes, including detailed instructions, can be found at www.shakerovalbox.com. Thanks to a comment by Gary Roberts, there is a blog post today. Gary asked in my last post why I hadn't, instead of removing the bulk of the waste from the lap joint with a chisel, used a rabbet (rebate) plane instead. According to Gary, "skewed rabbet planes were used for hogging cross grain material, particularly the wider width planes. The large mouth, curved escapement served to allow the coarse cross grain material to be ejected without clogging the plane. The outline of the lap was sawn to the line, the waste was hogged with the rabbet plane and finished up with a chisel or if narrow, with a router." 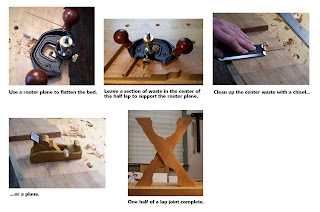 Suggesting that I use a handplane for a particular joint is like setting a plate of doughnuts in front of Homer Simpson—way too tempting. 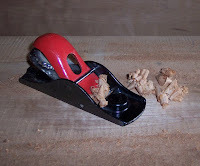 I love using handplanes. Since I don't have a skewed rabbet plane, I dusted off my #78 and took a few pass es within the layout lines of an untouched lap joint. Handplaning is a mesmerizing experience for me and sometimes I shave more than I should. In my state of handplaning delirium, I completely forgot about leaving a section in the middle of the waste area to support the router plane in final clean up. By the time I realized what I had done, the center section was 1/32" lower than the surface of the workpiece, which would result in sloppy joint with a scalloped bed. Nothing that a little tape can't solve. 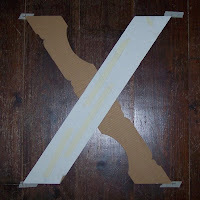 4 layers of masking tape, burnished flat, equals 1/32". It supported my router very well but did get a little chewed up toward the final passes. Still, a sticky shim saved me from a sticky wicket. Cutting lap joints by hand takes a little while if you are as slow as I am. To cut just one half of a lap joint took me....well, let's just say that if I were to charge $30/hour for my time, this joint alone would cost $5 million. 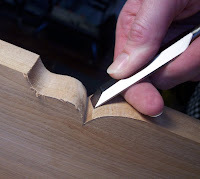 Layout the cut with a bevel-edged pencil, marking knife or exacto blade. Use a chisel to define the shoulder. Handsa w kerfs within the waste area. The more kerfs you saw, the easier it is to chip out the waste. My kerf marks are rather far apart because I get tired pretty quickly with handsawing. 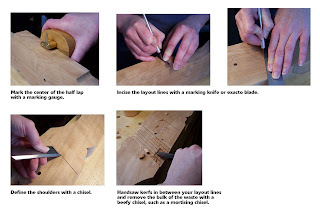 Use a beefy chisel to chip out the majority of waste then clean up the bed with a router plane or paring chisel. Because this is a wide lap joint, remove the waste from only half of the joint at a time and leave a section of wood in the middle to support your router plane as you clean up the bed. Remove the center waste section with a chisel and/or plane. Now it's onto the next one! I built this cabinet in 2005, and last year I noticed that the gap in between the two doors was no longer as even as they had been (they were never perfect, but close). The top of the gap was a little thinner than the bottom. Or so it seemed. I ignored it at fi rst, chalking it up to sloppy construction. But it got worse. After a few days, the gap at the top was less than a 1/8" and the gap at the bottom was 3/8". Here's what happened. When I built the carcase, I didn't pay attention to the arc of the endgrain. 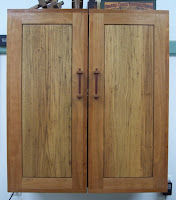 The second photo, taken from beneath the cabinet, shows the endgrain (on the tails). You can see that the crown of the arc is arching away from the carcase . What happens with a flatsawn board like this is the grain essentially wants to straighten itself out. So, the last tail in between the carcase and the door started to pull away from the last pin, effectively taking the bottom of the door with it. What I thought was an indestructible joint was failing...badly. So I added glue, clamped it up, and drove a screw through the pin. 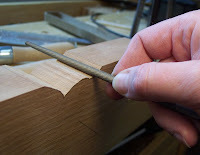 A better way to build a carcase or box is to orient the crown of the arcs toward the box. So, when the grain tries to straighten itself out, the pressure will be into rather than away from the joints. I haven't had the nerve to check the other side of the carcase, but if it does happen to the other board, I'll know not to hyperventilate. 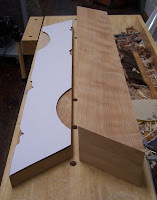 To shape the legs for the sawbuck table, I first traced the profile onto the leg blanks using the cardboard template. Then I transferred the profile to the other side of the leg. With the profile mark ed on both sides, you can check back and forth as you're shaping to ensure that the profile is square. I roughed out the shape on the band saw and then cleaned up the cut s with round files, triangular files, smooth files, a Nicholson #50 rasp, a Lee Valley rounded spokeshave, and sandpaper. The shaped leg in the last photo is sitting on top of what's left of the cherry that is being used to make this project. In my shop, a 9/4 x 12" x 11' piece of curly cherry has been patiently waiting to become a PA German Sawbuck Table, like the one I found at the Landis Valley Museum. I was not able to photograph the original very well because it was behind glass, but the photos still came in handy. From a page in a book, I knew the height, width, and length of the original. And from the front-on shot that I took, I figured out rough dimensions for the various parts with the help of a proportion wheel. 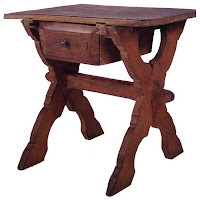 This project involves fun little details, like sliding dovetails, tusk tenons, an angled drawer, lettercarving, turned spindles, and baroque sawbuck legs. Trying to determine the angle of the legs was a monumental dilemma for a right-brained person who wouldn't know the Pythagorean Theorem from a Pierogie. So, here's what I did—I laid tape on the floor and marked corners of a rectangle that matched the height and width of the table (minus the table top). Then I criss-crossed two pieces of 5" wide cardboard within, but longer than, that rectangle; laid a straight edge from one top corner of the rectangle to the other top corner; and drew a line across the tops of the cardboard. Then I did the same at the bottom of the rect angle. This gave me the angles at which the legs needed to be cut. I eyeballed the baroque shape from the photos, sketched it freehand, and cut the pattern. After all four legs were cut to length, I had to figure out where to cut the half lap. The cardboard template wasn't reliable enough for marking the critical joint. So, I clamped two legs together, marked the middle, drilled a hole through the top leg and half way through the second leg, pegged them with a dowel, and scissored the m apart. Now I had to figure out how far apart to splay them so that the legs would support the table top and also rest squarely on the floor. 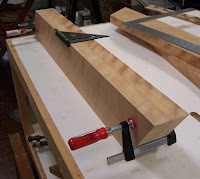 So I clamped a straight board to my assembly table (representing the table top), slid the legs against it until both ends laid flat against the board, then slid another flat board against the opposite ends of the legs (representing the floor). This showed exactly where to mark the half laps. There you have it—the right-brained person's guide to figuring out angles. 1. Keep an eye on the neighbor lady’s tree that’s about to be toppled. 2. After the tree has been felled and sawn, casually walk your dogs by her house to inspect the logs. 3. Just “happen by” as her strapping young son-in-law is chopping up the logs for firewood and inquire about the largest part of the trunk. 4. Be nice, and the strapping young son-in-law just might wheel your new workbench home for you on a dolly. Why the new workbench? Because I found Robin Wood’s website. 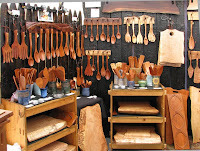 Robin is a woodturner and maker of treenware. 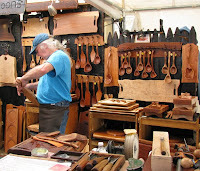 On his site, he posts video tutorials on how he makes his spoons, while sitting in his living room, and using a tree stump as a work surface. What fun! 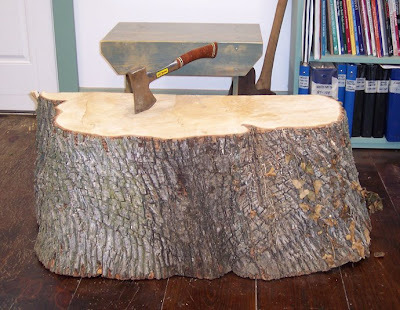 To start with a log, use an axe to rough out the shape, and finish with carving tools and knives is something I’ve always wanted to try. I have only made one kitchen utensil, a pasta rake, which works surprisingly well. It’s made of cherry and is finished with olive oil. There is something “right” about using wooden utensils and I can’t wait to use my new workbench to make more. I just need to find another neighbor who is planning to cut down a tree so I can “happen upon” some logs. *If you have not read Chris’ book and are thinking of building a new or upgrading an existing workbench (or are just looking for a fantastic read), do yourself a favor and purchase a copy. 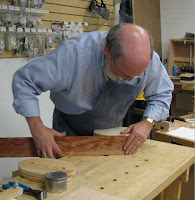 His book is replete with valuable information on building workbenches, choosing lumber, making bench jigs, and the whys and hows that aren’t found in other workbench books. 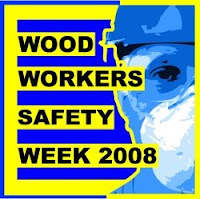 Marc Spagnuolo, The Wood Whisperer, has named this Woodworkers’ Safety Week. And with good reason. How many of us still have all 10 digits, don’t continually have to ask people to repeat themselves, and don’t have a woodworking battle scar or two? I’m guilty of the second one, but that’s due to too many Pat Benatar concerts in high school. For the female woodworkers who read this blog....you’re already wearing your safety gear so feel free to skip this post and head back to the shop. Two things are for sure: 1) woodworking is dangerous with both hand and power tools, and 2) guys love to outdo one another with “near-miss” or “how I lost my (fill in missing body part)” stories. 10. You can wave good-bye and people won’t think you’re making a rude gesture at them. 9. You can count to 10 without removing your shoes. 7. You can still type on a keyboard without having to hunt and peck. (Provided you know how to type in the first place. If not, proceed to number 6). 4. You won’t have to explain to the emergency room nurses why you have a spear of curly maple protruding from your belly button. 3. You won’t soil your drawers from kick back. 2. 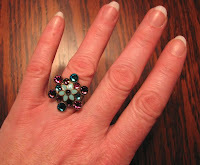 You can still dream of becoming a hand model. 1.You won't have to listen to your wife complain about you not being safe in the shop! There’s nothing dorky about being safe. Wear your safety goggles & hearing protection, use push sticks and the safety features that come with your tools, and don’t stick anything in the blade that you don’t want chopped off.